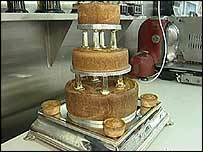 A West Yorkshire couple ignored years of marriage tradition on their wedding day by opting for a three-tier pork pie instead of a cake. Joanne Robinson, 39, suggested the special treat for fiance Stuart Booth - a founder member of the Ripponden-based Pork Pie Appreciation Society. The resulting 50lb (22.6kg) "wedding growler" was served to guests at their big day in Huddersfield on Saturday. Butcher Simon Haigh said it was the strangest request he had ever had. The mammoth pie was baked and assembled over a 24-hour period at Hinchliffe's farm shop in Netherton, near Huddersfield. Mr Haigh, the shop's owner said: "It has been very much a labour of love - a real team effort. "We started making the pork pie on Thursday morning and there was two or three of us working on it for 24 hours. He added: "I think it is the strangest request anyone has ever had. We've never heard of one before - certainly not a three-tier." Groom Stuart Booth, 45, is a keen aficionado of the traditional pie who has been known to don a special pork pie man suit to promote the cause. But he told BBC News that the decision to brand his wedding day came from elsewhere. He said: "It was not my idea. Joanne first mentioned it because she knows my passion for pies and I thought it would be a good idea." 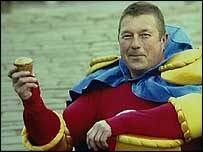 Asked if his mother-in-law approved of the plan, Mr Booth said on Friday: "As long as I'm not wearing the pork pie man suit - she won't be bothered." The Pork Pie Appreciation Society runs an annual competition to find the best pie in the country. The 2005 event has been put back a few weeks until Mr and Mrs Booth return from their honeymoon in the Lake District.